In a time of economic uncertainty and political change, optimism is paramount and no other color expresses hope and reassurance more than yellow. Best illustrated by the abundant flowers of the Mimosa tree and the sparkle of the brilliantly hued cocktail, the 2009 color of the year represents the hopeful and radiant characteristics associated with the color yellow. 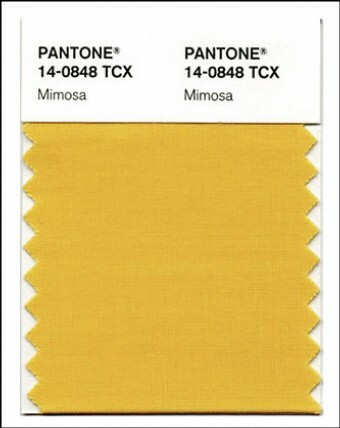 Mimosa is a versatile shade that coordinates with any other color, has appeal for men and women, and translates to both fashion and interiors. Look for women’s accessories, home furnishings, active sportswear and men’s ties and shirts in this vibrant hue. So what do you think? Do you like this color? Will you be finding ways to incorporate it into your home and wardrobe? Or will you wait until 2010 and hope that a hue you like better comes along? Black-Painted Rooms: Out or In for 2010? So, so lovely…hard for me to beieve anything I chose would be *in*!! *laugh* I am usually so far off the track it is laughable! In the right room I’m sure it is gorgeous. I have golden yellow walls in my dining room – but they are a lot lighter/softer than Mimosa. It looks awesome in candlelight and with the glow of Christmas tree lights. I think my room is too small for the rich darkness of Mimosa though. I like it. Its not too sunny, not too mustard-y. I am thinking of painting my living room a lighter color (currently terra cotta) and this would work with my current furnishings, rugs, etc. I am not a huge fan, but I can see it as an accent color in a room. 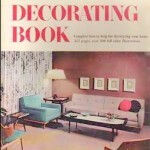 It reminds me of a beautiful room in the 1st Betty Lou Phillips book about Provencial Style. That room was done in cream with this color as the accent. I’m all for anything that brings a little sunshine into my life! Oh well, good thing I’m not that trendy, or I’d be really stressed about having to start repainting again after I just barely started! I think I’ll stick with the Nester’s Tobacco Road. A mimosa chair would be nice–and some huge accent pillows. With stripes. I actually dislike that color strongly when it comes to interior design. Too much of a 90s vibe for me. And too rustic. Definitly not for me. i think its pretty but its not my color. i dont think i would choose it. but i do like it. its a very rich, cozy color. Cali Girl’s last blog post..Random LETTERS all over! mishelle’s last blog post..The Moving Chair..
Not for me. Too warm and too country. I prefer blues and greens with accent colors of red, raspberry and cobalt. I like the colors of the sand and sea. Any yellow would have to be lighter and brighter, like the sunshine. Kathryn Wells’s last blog post..There’s a Whole Lot of Shakin’ Goin’ On! It’s possible I would try this in one room (a room with lots of windows) – I find this shade a bit harsh for my tastebuds. I think it’s really lovely and warm and soothing. I could see it painted on plaster walls in an older house with darkish woodwork and really lovely fabrics — like Amy Butler fabrics. If I had tea and a good book in a room like that, I’d never leave it. This is almost the color of my master bedroom walls, Blonde. It is a very pretty color and looks great with blue & white, so I guess I’m in style & will keep it. :) Of course, we can’t always follow the trends completely. a very similar color. Who Knew! That is the color of my bedroom which I was not wild about until now. I thought it was the “gold” of the seventies, but now that it’s the color of the year, I’m loving it! Never think I’m not affected by Peer Pressure! It reminds me a lot of my living room color but this one is a bit darker with tones of brown. It’s still a nice warm color – I like it! Emily@remodelingthislife’s last blog post..What is Frugality? Ohhh…. now I need to redo the entire house to be IN with pantone! I have a warm yellow but it’s a lot lighter. Maybe I’ll be THE color for next year! Hmmm, yuck! I’m just not feelin’ this one. Although last year’s iris was definitely all the rage, right? Pretty but a bit too yellow for me. It got a shrug from me. Yellow in our house just doesn’t work with the lighting and the wood. Prior owners had a lot of yellow…and the house looked jaundiced or something. laura @ the shore house’s last blog post..Baby it’s cold outside. I will get behind any color that is named after a cocktail! Love it and your blog rocks by the way! My bedroom and kitchen at our other house has this color. It looks great with mexican tile and hardwood floors! Good news! We bought a new house this past summer and it is this color. We’ve had lots of compliments on it, and we absolutely love it. I have a picture posted on my blog if you have any interest in seeing our builders idea of a modern day bungalow. I was going to say, pair it with last year’s color and you almost have a Michigan Wolverine house. 😉 I preferred last year’s, but I’ve always been a “blue” person. This is the color of my living room/kitchen. I did it in venitian plaster that you paint on then take off with a four inch scrapper. It was fun even though the ceilings are high. I think yellow is a neutral!